The ABC11 I-Team investigates a troubling problem on our roadways. RALEIGH (WTVD) -- Kelly Martin had the scare of her life in Johnston County last July as she was driving on NC Highway 42 with her two- year-old daughter, Emma. "I was terrified. I was scared. I was shaken up," the Wake County mom said as she remembers the bricks and cinder blocks that came flying off a trailer in front of her car. Daniel Smith was in his Chevy truck one vehicle behind Kelly with his daughter on their way to pre-school that morning. The chain reaction accident destroyed his truck. The wreck damaged two other vehicles. One driver was rushed to the hospital with serious injuries. The driver who caused the accident was charged with "failure to secure a load", and fined $280. 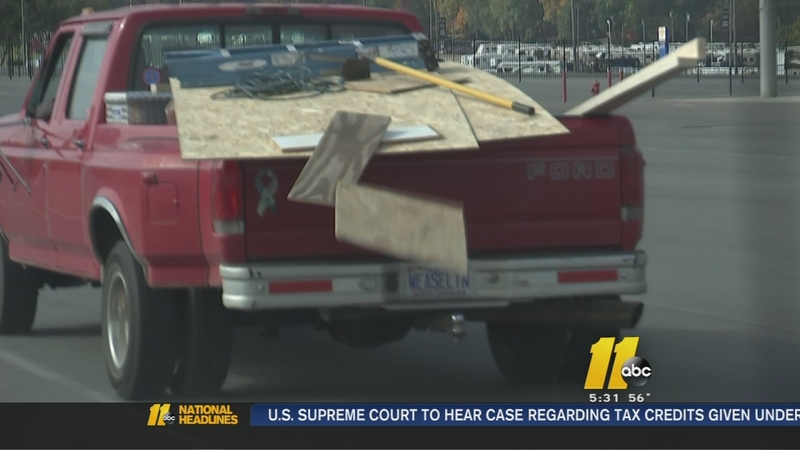 The I-Team discovered North Carolina has one of the lowest penalties in the nation for accidents caused by unsecured cargo. The Highway Patrol says there have been 2,500 accidents and more than 4,400 tickets given out because of debris which fell on roads from vehicles throughout the state in the past 5 years. "It's very dangerous," said NCSHP Sergeant Michael Baker. The I-Team hit the road over the past couple of months to look for dangerous overloaded vehicles. 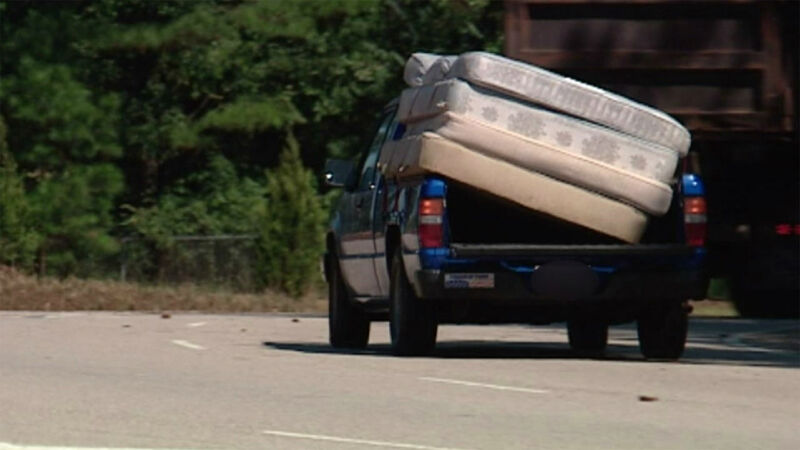 We saw vehicles in Raleigh on their way to a nearby dump hauling mattresses, appliances and yard waste. None had properly tied down their load. Do loose truck loads pose a hazard to drivers? The I-Team investigates. Sergeant Baker took a look at the video we captured while surveying the streets and pointed out the violations against the state's secured cargo law. "A load cannot be beyond the left side of the vehicle at all. It can extend six inches from the right side of the vehicle, but it cannot extend from the vehicle's outermost wall by any amount." The federal government is also concerned about the problem. In 2012, the General Accountability Office concluded that states need to crack down on these hauling hazards. Investigators discovered 440 people were killed nationwide in 2010 by debris falling out of unsecured loads. "It makes you angry. You never know. You never know. Always pay attention," Daniel Smith warned. After the Johnston County wreck, Smith and Kelly Martin are keeping their eyes out for cargo that could fall from other vehicles due to loads not properly tied down. "We were blessed. The Lord looked after us 'cause it could have been so much worse," Kelly said. 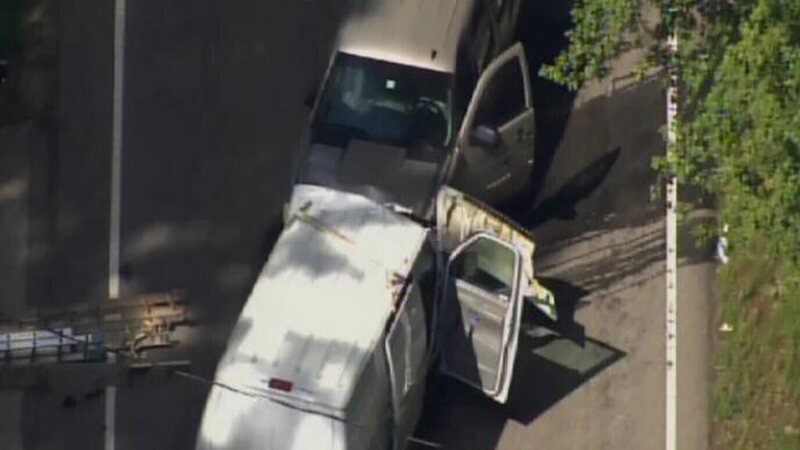 The Highway Patrol says if you see a vehicle carrying unsecured cargo, call 911 or *HP. It could save your life or someone else's life.